Breaking down Michigan's 2016 schedule with a look at the "should win" games. It's a college football fans' summer ritual. We breakdown the schedule. We count the obvious wins. We count the "should" wins. We count the potential losses and toss-up games. We do it every year. Everyone of us. Sure, it's easy to look at Michigan's 2016 schedule and see the Michigan State, Iowa or Ohio State games and pick those as potential losses or toss-ups...I mean, there's always going to be marquee opponents that fall into that category no matter how confident you are heading into the season. Utah was always a loss in my head, despite having Jim Harbaugh on the sideline. But after that, things really got cooking. Blowout wins...which shocked me frankly...against Oregon State, UNLV, BYU, Maryland and Northwestern set Michigan up for a potential run at a championship season. The heartbreaking loss to Michigan State right before a bye week was brutal. And I think that showed against Minnesota on the road on Halloween night. Minnesota was playing inspired football to honor their former coach Jerry Kill...and Michigan's bevy of sloppy errors kept the Gophers in the game far too long. 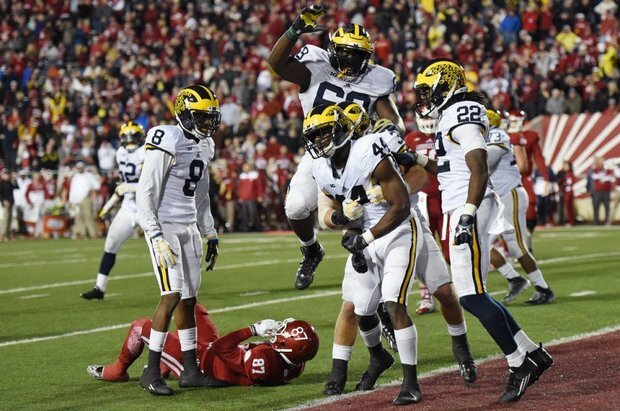 For the second game in a row, it came down to the final play with fate smiling on the Wolverines this time. It's hard to think any honest Michigan fans thought the Minnesota game was a loss in the preseason. But as the season played out, it had all the markings of a classic trap game, and it lived up to that. What didn't have any markings as a trap game was Indiana on November 14th. Michigan had just rolled Rutgers the week before and looked primed to do the same to the Hoosiers. Everyone had the Indiana game marked squarely in the win column. No doubt about it. But once again, Michigan mistakes, a defensive line being held together with athletic tape, and a Hoosier rushing offense unlike anything Michigan had seen all year combined to give us the 2-overtime thriller we all witnessed. It was another scare that Michigan had survived to at least keep them in the Big Ten championship conversation. And then a bunch of other things happened and then Michigan beat Florida 41-7 in the Citrus Bowl. Michigan's schedule is loaded with tough conference road games. Iowa, Michigan State and Ohio State are already on everyone's watch list, so I don't think we need to address those here. We're more interested in the "should win" games. Those games against relatively decent, middle of the pack-ish squads that are probably bowl-level type teams that could provide Michigan a good scare if the Wolverines don't show up to play. On paper, theses are all wins. Hawaii played both Ohio State and Wisconsin last year that were outscored 66-0. They then lost to Boise State 55-0. They also played UNLV (a Michigan 2015 common opponent) and lost 41-21. Hawaii's only 2015 wins came against Colorado (a Michigan 2016 opponent), UC Davis, and Louisiana-Monroe. UCF lost every game in 2015. Yes, I know they fired George O'Leary and hired Oregon's offensive coordinator, former Nebraska star Scott Frost as his replacement. But to think they can circle the wagons fast enough to come into the Big House and steal a win in week 2 is a long shot at best. Crazy things can happen, and I don't want to temp fate any more than I am already doing here, but I just don't see Colorado as a loss at all. I mean not even close. Easily Michigan's two biggest home games right in that sweet spot of late Sept/early Oct when it just seems like Michigan plays it's best football of the season...historically anyway. I like Michigan in these two games for the reason I just mentioned, but also because I think both Penn State and Wisconsin are highly vulnerable in 2016. I think James Franklin is on the hot seat in 2016 and it's going to be a long season for the Nittany Lions. Wisconsin has maybe one of the toughest schedules in the country could easily already have two losses by the time they show up in Ann Arbor in October (LSU and Michigan State). But being who they are, I'm never going to be supremely confident that Michigan is going to walk all over PSU or Wiscy. Those are two proud programs with enough playmakers to easily give Michigan a game if things go a certain way. Both of these games are toss ups to me. OK here's the thing...these are all "should wins". All 4 of these squads are chum for the upper crust of the Big Ten. In any season, Michigan should be able to just show up and put a check in the win column. Which is exactly why all 4 of these games scare me. Rutgers only scares me because it's on the road at night. The scar of 2014 hasn't fully healed yet. But with that said, Rutgers is just awful at playing football. Illinois has a new coach...Lovie Smith...so that's interesting. Maybe he'll be just the spark Illinois needs to reignite their mid-90's magic? Probably not. Maryland? Hey, I think Durkin can do some things in College Park. He's trying to build something there and I think he's going to have a surprise win this season. Just please don't let it be against his former boss. PLEASE! And then there's the Hoosiers. Indiana will likely be a sub .500 team when they show up for Michigan's home finale. Michigan will likely not be. But even though the spread for this game will probably hover around the low-20's, that's not going to fool anyone who saw what happened last year. Indiana can score points...a hallmark of Kevin Wilson's offenses in Bloomington, although they lose a lot of offensive talent from a year ago. The trouble is just stopping the other team from doing the same. If Michigan can get to the end of the season without any major injuries on the defense, I think this game will go smoothly. But if the DL gets banged up like they did last year, that will make stopping good rushing offenses like Indiana that much tougher. So there you have it. I count nine "should" or "will" wins on Michigan's 2016 schedule. The biggest threats are going to be Penn State and Wisconsin for obvious reasons. The remaining 4 Big Ten should wins are going to just have to come down to a fluke for any of those games to be even remotely close. That just leaves Michigan's daunting road games against Michigan State, Iowa and Ohio State. We'll break those down in a later post.